Crisis Intervention Team (CIT) programs across the country help direct persons with mental illness into treatment instead of inappropriate incarceration. The forty-hour training provides practical techniques for de-escalating crises. Officers learn to integrate their police training with some different approaches to a person they believe to have a mental disorder. Role playing is utilized to make the experience as close to reality as possible. 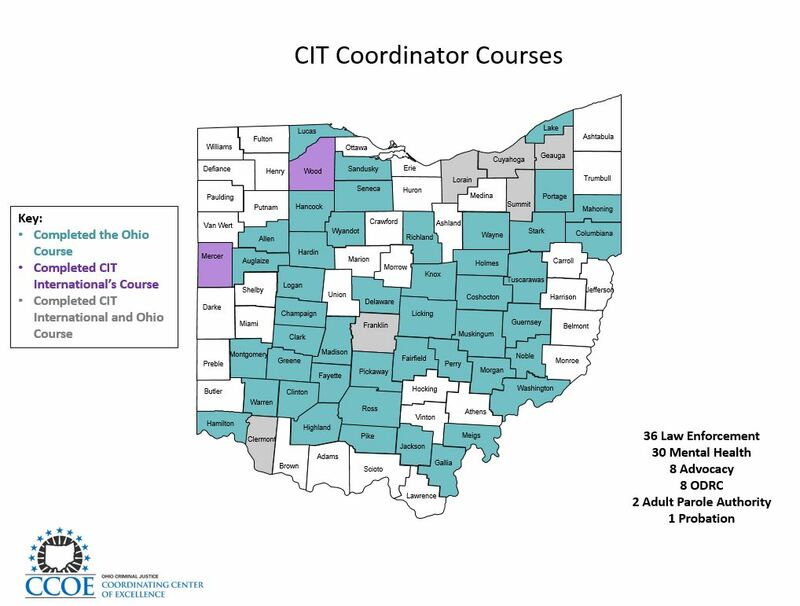 Ohio’s CIT Strategic Plan was written by the Criminal Justice Coordinating Center of Excellence (CJ CCoE) in cooperation with the Ohio Department of Mental Health and Addiction Services, the National Alliance on Mental Illness of Ohio, the Office of Criminal Justice Services, and the Ohio Attorney General’s Office in order to provide a roadmap to continue development of Crisis Intervention Teams in Ohio. The plan identifies strategies beyond training to build key elements that will strengthen CITs and their foundation for success. The ultimate goal is to have a fully developed CIT program in every county, with every law enforcement agency within the county participating.